Camelback Mountain has had their smaller local "Camelbeach" water park for the locals of the Pocono Mountains since 1998. However, with Great Wolf Lodge now in their backyard and Kalahari moving in soon, Camelback Mountain has fired up a new plan. In Spring of 2015 Camelback will open their own $163 million dollar Indoor Wate rpark Resort called Camelback Lodge and Indoor Water Park. The new resort will be located at the base of Camelback Mountain and will be the largest indoor water park in the US constructed at in one phase. It will play host to 453 resort rooms and boast an impressive 442,000 square foot, eight story high building. 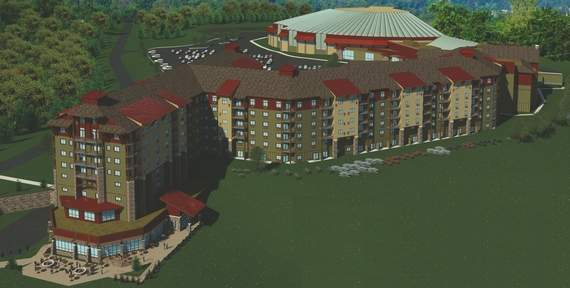 This new resort and water park addition represent the largest and most expensive upgrade in the mountains 50 year history. No word yet on how many new jobs this will bring in the locals of the Pocono Mountains which at one time was the place to go for honeymoon's and resort hotels. Over the years most of those once famous resorts have been lost due to economic downturn, it's nice to see something new moving in!